Personally I love mixing it up – older furniture re-upholstered in contemporary fabrics, antique hall table with über slick modern vases, re-claimed old flooring with elegant Corbusier iconic chairs, old masters facing 21st Century art- why not? Personally I love mixing it up – older furniture re-upholstered in contemporary fabrics, antique hall table with über slick modern vases, re-claimed old flooring with elegant Corbusier iconic chairs, old masters facing 21st Century art- why not? 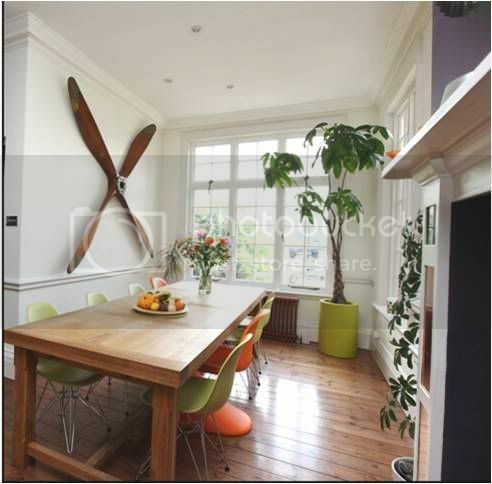 Below some tips and ideas for that contemporary and edgy look in a kitchen and a hallway – eclecticism is the key. In this kitchen we have a contemporary wooden table made of oak – simply designed, sturdy but not heavy. The reclaimed wooden flooring anchors the table down but all that wood could have been just “too much” if it had not been lifted by a bit of colour. 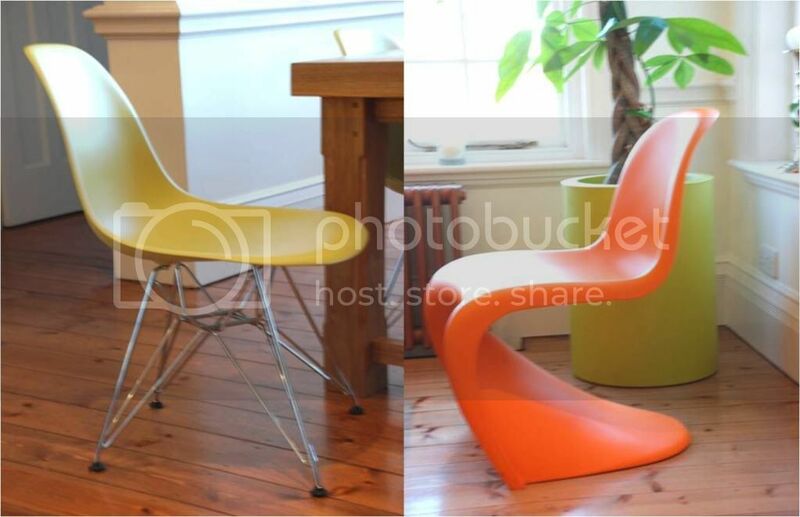 So in comes the Eames DSR chairs, known as the Eiffel made of polypropylene, in lime green paired with two Verner Panton chairs in orange. These are re-issue of the original, the high street does sell copies of these, but personally I think you should go for the originals – designer’s rights are paramount if we are to continue seeing innovative designs. You can buy original ‘plastic’ chairs from Heal’s, John Lewis and The Conran Shop for example and the sales are still on at some of the retailers, so a good time to buy some design icons. keep it simple with no fluffy decoration; otherwise it would make it look like a circus! Different centuries but they still like each other! You would think that totally different styles would clash – after all stylistically they are complete opposites. One is paired down and streamlined, the other architectural in its design it is more detailed and textured. 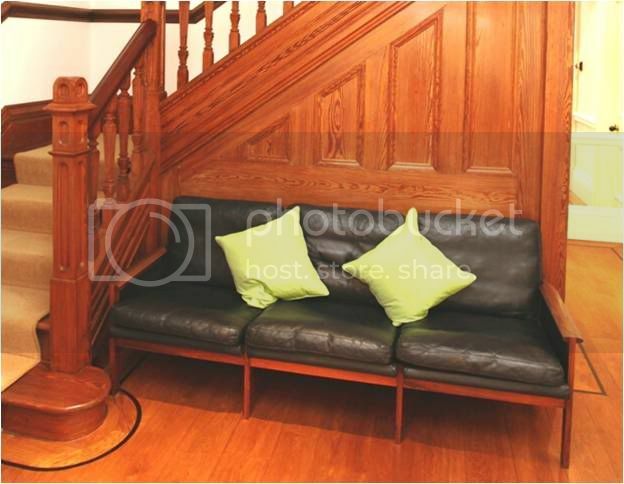 In this hallway we have a 20th Century Danish sofa brightened up with lime green silk cushions- again that lime green! Framed by a beautiful panelled staircase from the Edwardian era – it fits beautifully. The link here is the wood elements. **Françoise Murat & Associates specialise in interior, garden & landscape design. **For more garden and interior design information visit us at www.francoisemurat.com.